I have to ask: how do you organize training around so many different arts and tactics? Seems like kicking/boxing/trapping/grappling/weapons/range transitioning would be a lot to swallow as far as developing a personal program or curriculum. Techniques are a method of moving from one position, one attacking or defending tool or range to another. They are a method of transition. 1. You cannot execute techniques properly without a support structure that allows for its expression. Simply put, this means you cannot throw a punch to someone’s face if you are standing 10 feet away from them. Your punch could be the best technically accurate punch humanly possible, but if you’re not anywhere near the target, you cannot use all your years of hard training to good effect. 2. Techniques cannot be executed properly if you get knocked out before you can use them. This means getting knocked out before, during, or after your execution of technique. 3. Continued technique combinations cannot be executed properly if you don’t have a stable base from which to use them. You also cannot flow easily to other techniques, attacking tools or ranges if you are unstable after being attacked. If you hit someone, there is an impact rebound from the hit. If your base is untrained to adapt to this rebound, it will throw off any of your successive attacks in flow. The flow will be disrupted. If you are hit by someone, and are untrained to be stable and dynamic from the attack, it will disrupt the flow of your continued combinations and attacks. This is how you pare down which techniques are worth your effort to train. Techniques have to allow for natural execution freely AND under stress. They have to allow you to move efficiently with the physical structure of your individual body moving toward or away from resistance AND when engaged against resistance. Everyone has a different musculature, mentality and spirit that can be primed to optimum levels. By the way, this individual nature is not an excuse to be lazy just because your muscles lay over your skeleton differently or contract at a rate differently than the athlete next to you. 1. They have to allow for continued use of successive attacks. These successive attacks have to flow naturally with one another. For example, it is less efficient for your to throw 2 rear hooks than it is for you to throw a rear hook followed by a lead uppercut or a jab. 2. They have to be dynamically adaptive to information gathered through your senses. Visual, auditory, tactile. If you are in the clinch with someone, and your trained peripheral vision detects an incoming strike from a second person to the side, then you have to be able to use your current tactile read to engage your base to manipulate the person in the clinch into the incoming path of the new attack. The technique used for this manipulation has to be extremely efficient so you conserve resources, maximize leverage, and allow you to get your cover engaged quickly. 3. They have to be readily detachable—mentally as well as physically. This means techniques have to be able to be released quickly so you can engage another technique, range, or attacking tool quickly. At some point in our sparring or fighting, most of us have found ourselves in a tunnel-vision mindset or using techniques that are an end unto themselves. I am reminded of watching people trying the axe kick to another person’s shoulder or collar bone. This is one of those “end unto self” techniques. It almost always gets the kicker’s leg caught, their base unbalanced or swept out from under them, or completely restricts them from flowing to any other attack naturally. Mentally, we have to make sure we don’t dismiss our sensory information because we have a hard line mentality to get that f-ing armbar at all costs. Especially when a kick comes to our head from the side. I watched a fight one time where the combatants were on the ground, and one of them was fully engaged in grappling and trying to secure a leg lock or ankle lock only to be taken completely by surprise when his opponent started punching him in the head. You can’t dismiss sensory information, and you can’t be so focused mentally on one thing that you forget a fight for your life can include any kind of attack at any time by anyone. 4. 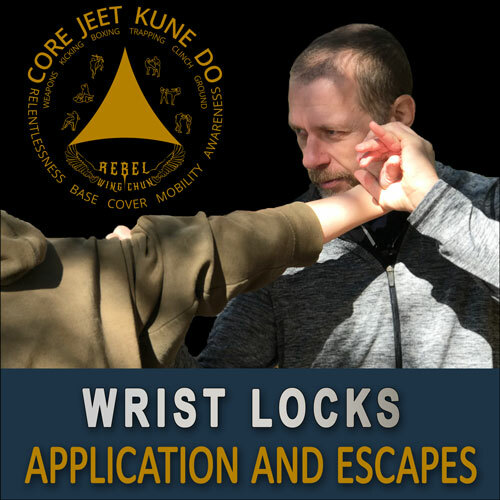 For Core JKD, techniques have to allow for multiple attackers and weapons. If I train my base to where I only have a Rocky Balboa grounding for throwing powerful haymakers or hooks, I will surely be deficient when my attacker slips a knife into the fight out of nowhere. This point really reduces the kinds of techniques you can use and how to train them. With the above understanding, you get an idea on what techniques to train and why. These three elements alone allow for the adaptation and success of any functional technique versus any opponent in any environment. Base allows for stability in movement and against opposing movement. It centers body, energy and balance. If you have a good base, you may hear the rush of air as an attacker is coming at you. You will feel their earliest touch on your skin or clothing and translate that into movement that turns you in the direction of the attack. Your feet set for adaptive stability, and you engage the upper body with proper cover using controls or manipulations that offset or defeat the attack and set up for counter-attacks or range changes. Cover is a process of providing upper limb support structure that prevents the head from whiplashing and the brain from receiving concussive damage. It is a process of reading incoming motion (visual periphery or tactilely) and moving the body with the motion to lessen the impact or to get the head out of range of an attack. Mobility enables pathways for movement. It is active, always changing, and outward expressive. In Core JKD, I have modified a lot of traditional techniques, gotten rid of many completely, and created new ones because I had to solve problems where no one had a solution that fit with our training methodology and directives for combat and survivability. In your own training, you have to be ready and willing to give up something that doesn’t allow you to live at the end of a fight. Pure and simple. No, this doesn’t mean you can’t train your favorite things like that axe kick (sigh), but it should help you understand why you would wish to or not. On my YouTube channel, I show an incredible variety of techniques and methods for training in ways you may not ever have seen. I get away with this because I am not limited by tradition or culture. I post videos that are completely Core JKD original. In some of them, I take a traditional mindset or methodology and modify it just enough so that you can see how you can make something work that wasn’t working in the traditional sense. People get a little persnickety when you tell them that, “Yeah, that really won’t work.” So I try to avoid doing that. And then you have the brainchildren of the internet who think I am doing a traditional technique completely wrong. For the rest of you who truly wish to advance in your training, I’m here to help in any way I can. This blog should help you start paring down what techniques to use. It should also help you understand that your techniques will be poor in execution if you don’t have proper Base, Cover and Mobility. Make your body an adaptive machine capable of swift transitions against resistance. The techniques will fall into place after that. Speaking of techniques. 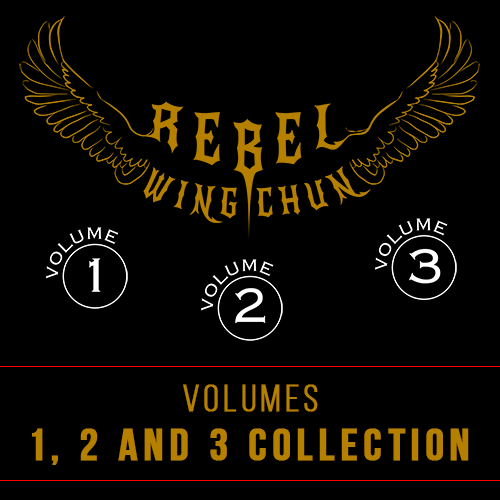 We are now announcing our first Rebel Wing Chun Vol 1 videos for sale. Click the image to find out more about it. 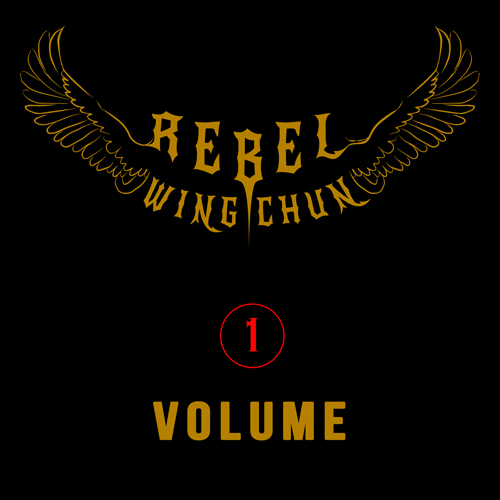 My information comes from 20 years+ of intense research and development in the fight/defense training game with people of all ages, sizes, strengths and abilities from backgrounds including the different branches of the military and law enforcement, as well as high level athletes and top instructors in the world in Jeet Kune Do Concepts and the supportive arts therein. In addition, I also have a job that allows me to study people and their patterns in normal life, from the dire to the sublime. These fields allow me the benefit of being able to present you information that has been tested in real-world conditions. 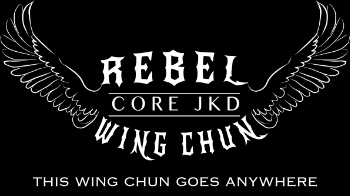 I created Core JKD as a method for training the core elements that make techniques and your tools work. You, the Individual. It is a distilled training methodology primed for speeding your advancement in training and life.